Can we talk about retirement for a minute? It’s super important for business owners because we don’t have a pension, or a company sponsored 401k. I’ve talked to too many self-employed people who are in their 30s and have not started saving for retirement yet. This is a huge mistake. If you are self-employed, no one else is going to pay into your 401K, or give you health benefits. Your retirement is totally up to you. Know that retirement is not about moving to Florida and going golfing every day. If that’s what you want to do, that’s cool, but that’s not what I’m getting at. Retirement is about financial freedom. Not worrying about what happens to social security because you won’t need it. Doing what you want in your later years, even if that’s continuing to work. Having the means to travel, or hang with your family more often, or build more homes in Mexico. It doesn’t have to be when you’re 65, I want to retire in my 50s. Wouldn’t it be nice to work on something you love, and have time for your hobbies, without worrying about the bills, ever? That’s why retirement matters. It isn’t difficult to get started, but get started you must. When I first started thinking about saving for retirement, I had no idea how much I needed to save. 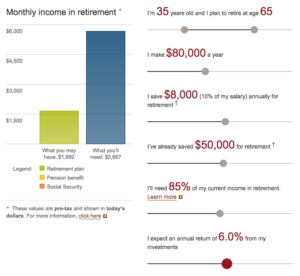 I found a retirement calculator online and ran some numbers, and I was shocked. All the numbers I ran ended in “Retirement savings run out at age 81” or “You need to save more.” I had to adjust the settings to save more, retire later, and use less of my income. It can be pretty discouraging. These days people are living longer and getting less benefits from pensions and social security, and it’s scary to think about being old and broke. How do you want to live in retirement? With the average rate of savings of most Americans, they will have to live on much less money in their old age. Do you want to live on 40% of the income you have now when you are 75? You might have a lower cost of living, with a paid off house and the kids all moved away, but maybe not. Personally, I don’t want to live a sub-standard lifestyle when I’m older. I want to travel the world, eat good food, and live how I choose. If I don’t save enough now, I won’t have the option to do those things. Saving and investing doesn’t have to be your only plan for retirement, but you don’t want to end up old and broke because your other plans fell through. You may think you’ll sell your business when you get older, and retire on that money. There is nothing wrong with this option, but lots of things can happen between now and then. Selling your business can be a very difficult process, and you may overvalue your company. Talk to someone who has sold their business, or an investment banker who brokers these type of deals. What if something bad happens and your business goes under? You never know, might as well invest in other areas to be safe. There are always the rumors of the demise of social security, and I don’t know if they are true or not. It certainly is not a sustainable government program, so I wouldn’t rely on it. It’s not enough to live on even if you get it, consider it icing on the cake that you may or may not receive. Don’t depend on some magical epiphany in your later years that takes care of your retirement for you. It won’t happen. Saving and investing takes time, and the sooner you start, the better off you’ll be. Save, stash it in a safe investment, and repeat. It’s that simple. I think saving 15% of your gross income is a good place to start. Once you get comfortable with that, try to increase it to 20%. An index fund is a low risk, long term investment in the stock market as a whole. It doesn’t require active management, and historical returns are around 7%. By investing through your IRA, you will get tax benefits. You don’t need an actively managed mutual fund, you will lose too much money to fees. There are a few different types of IRAs, many business owners can take advantage of a SEP IRA. Make sure to talk to your tax advisor on what the right account is for you. There are other types of investments you can consider, such as real estate, but investing is a skill you need to learn. Put your money in an index fund until you learn more about investing in other areas. If saving 15% of your income sounds like a lot to you, you should take a good hard look at how you are spending your money. Start a budget. Stop buying shiny things you don’t need. Most of all, live below your means. Picture a time when you won’t have to grind for that next client, or worry about why sales are slow this month. Financial freedom is an attainable goal, but you have to get started today. Next: Next post: What Makes Your Product Different? Great post. More people should save for retirement I agree. Plus 401k contributions are tax deductible up to a certain amount. I wish it were more. That would DEFINITELY encourage me to give more. I’m going to go call my local congressman. See ya! Wonderful post. 90% of the battle is committing yourself to an investment plan and setting it on autopilot so you don’t have to think about it every month. Choose a portfolio that fits your comfort level. If you’re 100% stocks, you could see a 50% loss in portfolio value, and it could take up to 12 years to get back to even. The worst thing that can happen after a large loss is you lose your nerve, sell, and stay out of the market during the recovery. Make sure you select a portfolio that’s simple for you to manage / automate. Target date funds are a single investment that becomes less risky over time. If you’re going to hold more than one fund (ex: stocks and bonds), determine your desired allocation (ex: 75% stocks/ 25% bonds), where new contributions will go (ex: lagging asset, so if stocks are at 70% of portfolio, new money that month goes there), and when you’ll rebalance (either yearly or when they get off by a certain percentage). If you’re willing to spend a bit more time researching and managing your portfolio, you can optimize based on your priorities (ex: low volatility, dependable growth…). Take a look at PortfolioCharts.com and compare how different portfolios perform (ex: Golden Butterfly vs 100% Stocks). Awesome advice Bill. I was just also just recommending Vanguard’s target retirement funds to a friend, because they are set-it-and-forget-it as far as stock/bond allocation. I’ll have to check out the resources you mentioned, thanks again. Great article, Scott. It sounds like you are invested solely in the VTI index fund. So if you are investing 15-20% of your income and the IRA max contribution is $5,500, how does it work for the remaining amount after that? Is that a separate account or does Vanguard have an easy way to just allow you to invest beyond $5,500? I’ve been contributing the max amount to my IRA for the last several years, but I’d like to start going beyond that. As you mention, that max limit just isn’t enough. Thanks for the insight! Hey Kevin, the only way to go over that in an IRA is with a SEP, which means you have to own a business. Even without a SEP there are other great investments out there with tax benefits, such as real estate. I’m actually drafting up a post right now on real estate investing. SEP IRA lets you save close to 20% of your business’ earnings, up to $54,000/yr. Solo 401(k) does the same, but has the added benefit of saving 100% of your first $18,000 in earnings, so comes out ahead if you’re 20%). You can also contribute $5,500 to a Roth IRA if you are under the income limit ($117k single, $184k married). You can also do a Backdoor Roth IRA contribution at any income level. If you have a high deductible health plan, you can contribute $3,400 for an individual plan, or $6,750 if it’s a family plan. This is triple tax advantaged: tax-free money goes in, it grows tax-free, and you get tax-free withdrawals if you’re over 65 OR for qualified medical expenses at any age. If you can cover current medical expenses out of pocket, you can let the HSA grow tax free and reimburse yourself with tax-free withdrawal any time you want (ex: in early retirement, before you can touch your IRA). You can invest in government bonds (I and EE bonds), which are tax deferred for however long you hold them (up to 30 years), and could be tax free if used for education expenses. I like to use I Bonds as an emergency fund instead of savings account or CDs as you get the same or better interest rate, it’s tax deferred, and if inflation ever picks up the interest adjusts upwards accordingly. And if you’ve exhausted all your available tax-free and tax-deferred spaces, you can always open a standard (taxable) account with Vanguard or Fidelity. Less than / greater than signs must have been interpreted as markup and it stripped out some content. Bonds are a good part of an overall strategy, but for me I’d rather look for higher returns because that will have larger impact in my wealth over time. This is getting much more complicated than this post was trying to achieve, but fun to talk about nonetheless.